I haven’t really made anything gluten free before so I set off to learn the do’s and don’ts outside of my general knowledge of gluten. Interesting enough I found out that I had to be careful about buying things labelled “Gluten Free”. Sometimes things like baking powder say they are Gluten Free but then when you look at the ingredients they are wheat based. As a rule of thumb it was recommended that you always check the ingredients and check there is nothing wheat based included – even looking at things like flavouring or preservatives. I found out that even though coco is gluten free it also depends on the brand. Some brands of cooking chocolate also had warnings about containing gluten, where as if I was to buy the same brand but as melts or choc chips it didn’t. I could have been super paranoid but if it had a warning I would not get it; I thought it was better to play it safe. I had everything planned out to adapt Donna Hay’s brownie recipe into a gluten free version when I remembered brownies were “the thing” of another girl attending – and you don’t want to appear like you are trying to out-do someone! 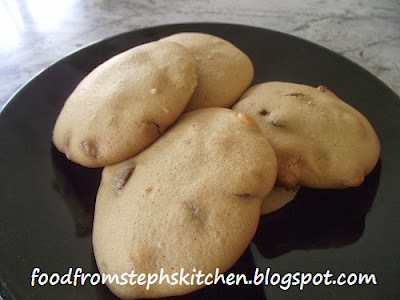 So I decided to adapt my choc chip cookie recipe to make it gluten free. Off to the shops I went, checking my ingredients as I went to ensure I wasn’t just assuming they were gluten free. I decided to simply use gluten free flour instead of a rice flour and almond meal combination. I ticked everything off the list and headed home, very proud of myself. 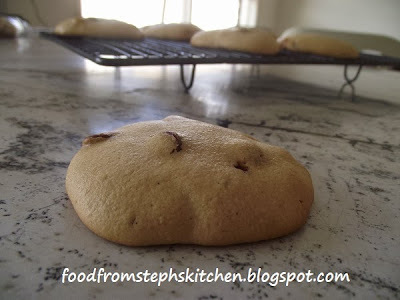 If you don’t want gluten free cookies simply switch the gluten free flour with plain flour. Firstly (before you forget) preheat your oven to 180 C / 350 F.
In a large bowl mix the eggs, sugar and vanilla extract until the eggs are whisked and everything is well combined. Next add the melted margarine. You could use butter but I just like using margarine in cooking more than butter. Sift the flour in a separate bowl and then add it to the egg and butter mixture, about ½ a cup at a time, mixing it until it is smooth each time. Finally add the chocolate chips and mix them through. You might be looking at the mixture right now and thinking it is way too runny to be cookie dough. Don’t worry I was thinking the same thing when I made them, but it’ll turn out delicious. Instead of rolling the dough like you normally would, you spoon it. Cover two large baking trays with grease proof baking paper, and then spoon dessert spoons of mixture onto the tray; make sure you leave room for the cookies to spread. You might not be able to spoon all the mixture onto your trays. If this is the case simply cook the cookies in batches, adding new baking paper each time. 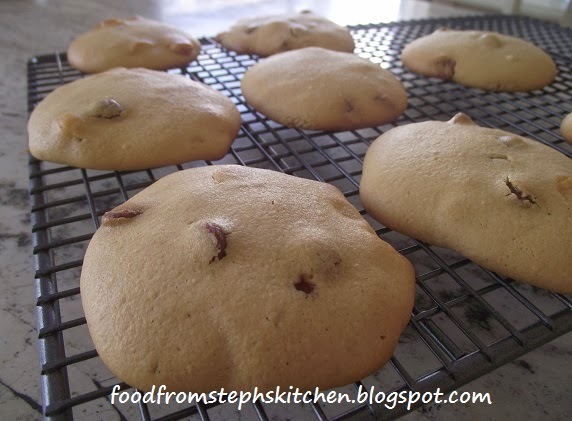 Bake the cookies for 10-15 mins, making sure that the cookies are firm to touch. Place your cookies on a wire rack to cool – or you can eat them while still warm! I thought I would make these the first of my Christmas recipes as I just love making little gift bags of cookies for Christmas gifts. I simply make mini cookies instead of large and wrap them in cellophane, finishing off with ribbon. I also think using the normal sized cookies and wrapping them in the cellophane to make a bon-bon is great as well. I just love gifts that are home-made like that; you know someone has gone to that extra effort.